Portuguese doomlords A Dream of Poe have moved around a bit since their inception, now being based in Edinburgh. Their new record, ‘An Infinity Emerged’ is a monolithic slice of gothic doom majesty, and is out on Solitude Productions. The mournful creak of ‘Egregore’ opens the record in a suitably gloomy fashion. Taking notes from masters of atmospheric misery My Dying Bride, A Dream of Poe weave elegant riffs and keyboards around vocalist Kaivan Sareai’s classy clean tones. The solo that rips through the grey at eight minutes is a piece of art, while ‘Gothic’ era Paradise Lost looms heavily over the crush of the heavier parts. Consider the riff that opens ‘Lethargus’ as one of my riffs of the year. It’s titanicly simple and yet instantly gratifying, and begins what is one of 2015’s most towering doom creations. It is almost totally void of the deathlier side of doom, and seeks instead to create something emotional and soulful. The croon of ‘The Isle of Cinder’ has some beautiful vocal harmonies, and each track is immersed totally in the task of wringing an emotional response from you. 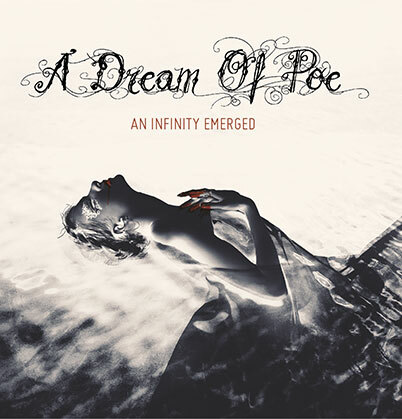 A Dream of Poe’s mournful elegies are a perfect fit for a land descending into winter. Soulful, melancholic and heartwrenching in points, these guys have absolutely nailed it. Seek and ye shall mourn.